I'm Pretty sure most of the population thought the world was ending while Mark Zuckerberg was having a coronary! 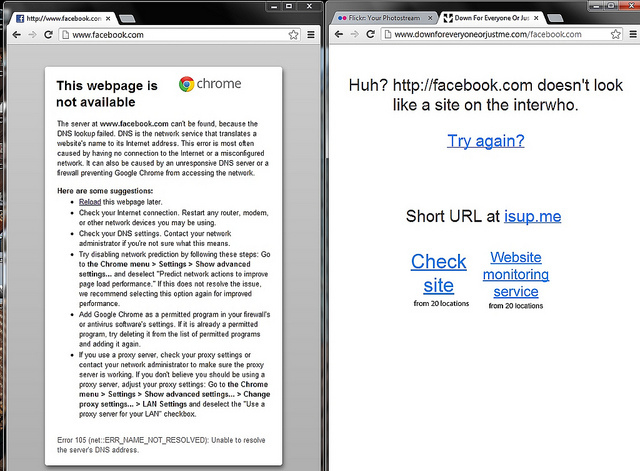 Facebook was just down due to a DNS error by the looks of things. Also Gmail was down earlier and Podbean changing over to the amazon web service (seemingly without prior notice). Just think we are not long now from the supposed end of the world (no the Mayans did not predict this would happen lol). What do you think of the events of the past few days? Do you think it is possible for Facebook and Google to be up 100% or the time?